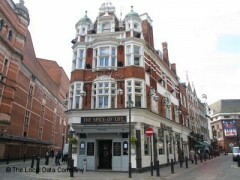 A classic, traditional pub with a touch of Soho flair. About: The Spice of Life has attracted many top acts, such as Jamie Cullum, Soweto Kinch, Darius Brubeck & Daryl Sherman. McMullen & Sons Ltd, the family brewers of Hertfordshire established in 1827, remain the owners of this historical property to this day. As well as their nightly performances, Spice of Life host live jazz every Friday lunchtime. It’s an intimate venue that has seen the likes of Jamie Cullum and Soweto Kinch turn up to play. Food is hearty pub fare. "A classic, traditional pub with a touch of Soho flair." Variety, that’s the spice of life, but not ones to take the advice of their own pub’s sign, this historic building has been in the hands of McMullen & Sons, the family brewers established in 1837, for as long as anyone can remember. Located on Moore Street at the start of Old Compton Street, a few yards from the Palace Theatre and with one foot in the heart of Soho, you could say that The Spice of Life holds an enviable position. There are a fair few grand buildings in these parts and The Spice of Life is one of them. Looking head on, the perspective of the big pub leads you though its doors and on into Soho. Naturally for a pub with as much history as this, the interior is an ode to classical fixtures and fittings, which means plenty of brass, floorboards and polished wood. Spread over various floors, its size means that The Spice of Life is a pub that you never have to wait to long to get served in. Having survived two World Wars, there is a fair bit of history attached to it so if it is traditional London that you’re interested in you’ll find it here. There is a menu of classic ‘British’ pub food, which includes burgers, fish & chips and good old gammon and eggs. On draught you’ll find Guinness, Fosters, Becks, Peroni and of course, the fruits of the McMullen Brewing company, a selection of cask ales. This isn’t the most likely place for a lively events schedule but you will always find live music at The Spice of Life. From Monday’s weekly open mic night to a range of independent acts who bring anything from jazz to folk.